Having largely recovered from an 'ouchy' lower back/hips, caused by overdoing it with the string trimmer (hey, I have an acre and an half to maintain here), I was able to get back to my hiking and biking routine. That was curtailed a bit through the summer anyway, as I spent time almost everyday pushing a mower about. No more of that till next year, I think. So, three or four hikes or bikes of varying length each week. In addition, of course, to my regular weight training. I'm not giving up on that after forty-some years! I may not be as big as I was in my peak bodybuilding years but I am in the leanest condition of my life. I look better than most guys half my age. Maybe even a third of my age. No brag, just fact, as they say. Well, somebody says it. This does not mean I am necessarily healthier than those younger guys, just that the body looks better. 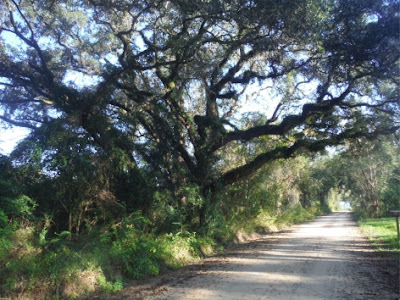 I do a medium-length bike ride most Sunday mornings, up to Graceville and back on the paved road—that would be Peanut Road. It's the only time I feel safe pedaling up that busy and somewhat narrow way. To the Piggly-Wiggly in town and back is about seven miles. I could do my grocering by bike, if I wished, and might when the weather grows a little cooler. But I can take various dirt back roads up to Graceville and add a mile or two to that distance. Still entirely doable, should I wish. But I can also simply ride (or walk) those many back roads just for the fun and exercise, and frequently do. Sometimes a wider tire might be helpful, when conditions get dry and sandy; I have 32s on the bike and can live with that 'compromise' for now. The bike, incidentally, is an inexpensive Taiwan-made single speed, with commodious baskets for carrying whatever. Probably better suited to city use but here I am in the middle of nowhere! The photo above is from a recent jaunt, not too far from my place. I see loads of wildlife tracks when I get onto those dirt roads and sometimes wildlife as well. A deer ran in front of my bike the last time I was out, some time after seven in the morning (in this continuing hot weather, I ride early). Riding those back roads is the next best thing to getting down to the beach and surfing, and awakes some of the same feelings in me. Riding around on city streets would not be the same. It is the joining of nature and physical activity that does it for me. I've always enjoyed hiking and biking. I was a wanderer as a kid, whether we lived in town or country. My bike or my feet carried me away from whatever bothered me at home. I liked the solitude of it, the being-in-control of it. I still do.